Millerbird peering up from the edge of a Naupaka bush. Credit: Megan Dalton. 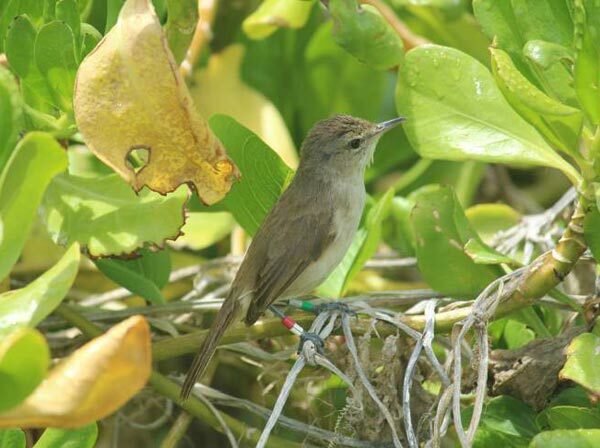 The latest count of endangered Millerbirds on Laysan Island in Papahānaumokuākea Marine National Monument found that the bird's population has doubled – to more than 100 – from the original total of 50 translocated birds released in 2011 and 2012. In the highly successful first phase of the translocation effort, 24 Millerbirds were moved 650 miles from Nihoa to Laysan in September 2011 in an effort led by U.S. Fish and Wildlife Service (FWS), American Bird Conservancy (ABC), and others. A second translocation of 26 birds took place in August 2012. Each release included a multi-day capture period on Nihoa followed by a three-day voyage to Laysan, and was carried out by a team of biologists from FWS, ABC and other organizations.